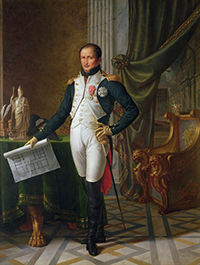 In the nineteenth century, New Jersey’s most illustrious resident was Joseph Bonaparte, the elder brother of Napoleon Bonaparte and former King of Spain and Naples. He fled to America after Napoleon’s defeat at Waterloo. In 1816 he acquired the former estate of Stephen Sayre in Bordentown, which was already known as Point Breeze. Joseph transformed the 200+ acre property into a magnificent estate. His palatial home housed the largest collection of fine art in North America as well as what was then the largest library in the United States. A mysterious fire consumed the home in 1820, after which he constructed a second imposing house roughly a quarter mile away. Due to its location on the main route from New York City to Washington, D.C., Point Breeze was visited by many of the leading dignitaries of the time, including John Quincy Adams, Henry Clay, and the Marquis de Lafayette. Today the property is owned by Divine Word Missionaries. In 2007 Monmouth University began a program of archaeological research at the property designed to identify the locations of Joseph’s houses and document the remains of the gardens he created. The sites of both houses have been located and numerous traces of Joseph’s occupation have been mapped and documented, including tunnels, wharves, wells, and several outbuildings. Artifacts found at the site include fragments of marble tiles, marble mantelpieces, gilt furniture hardware; thousands of fragments of wine bottles, and even pieces of rare French porcelain. Point Breeze is one of the most important archaeological sites in the state with extraordinary potential to tell us about elite lifestyles in the 19th century Delaware Valley. An NJN documentary about Joseph Bonaparte, premiered in 2009. For information relevant to this documentary, see Bonaparte’s Retreat.